Kleenex® trusted care* go* pack is rated 4.9 out of 5 by 562. Rated 4 out of 5 by Gerry from where to buy We want to buy kleenex that are 5.5 inches by 6.5 inches. Where can we buy these? We use them in our counsel in the car. Rated 5 out of 5 by Ladyhawk91208 from Kleenex On-the-go Slimpak I just love the On-the-go Slimpak. It fits so well in small flat places. I am sad that my local (Beloit, WI) Walmart no longer offers it. The offer the older purse-size packs instead now, and they won't fit in my purses. Can anything be done about this? Rated 1 out of 5 by Lynne22 from Too slippery The new pack design is too slippery. It slides out of my purse, and when I go to get one tissue, they all come out. Rated 2 out of 5 by zuki from No Longer Slim I loved these packs until you changed the size and made them thicker and smaller, now they are barely slimmer than the regular go pack. Rated 5 out of 5 by Bearhuntress from Always stays closed I love these tissues, but unfortunately haven't been able to find them in our area anymore, not sure why. Rated 5 out of 5 by foxygrandma from So much easier to get a kleenex out of than the other packs that you try to reseal. I found them in London and had to come to the internet to find them here. Love this pack for my purse. Rated 1 out of 5 by GogoGami from must contain some chemicals With some sniffles coming on a grab a package of Kleenex tissues. Although the packaging did not list any added softeners it wasn't long before my lips began to blister. Within 12 hours after using my lips were blistered. This has happened before when I was given tissues with a softening lotion added. No longer trust Kleenex. Rated 2 out of 5 by Andi from You discontinued the "doux" version?! Very disappointed that you have apparently stopped making the "ultra soft doux" version. This plain ultra soft is not as soft, not as strong, and the boxes are ridiculously ugly. My allergies and I are very unhappy. Rated 4 out of 5 by dncole23 from Right size These are so easy to carry. With allergy problems you never know when you will need a tissue. Rated 5 out of 5 by kittcat from Scented?! I got this as a stocking stuffer for Christmas and just opened them today. My nose was completely stuffed, but when I went to blow my nose I got the savory sent of green apple! I ran to my mom and immediately shoved them in her face to smell. She confirmed that I'm not crazy. Are all packs scented? The package gives no indication of being scented and I haven't heard of anyone else having a scented pack. I have the green pack so now I'm wondering if the smell changes according to the package?? I'm completely and pleasantly baffled. Rated 5 out of 5 by Murph from I have a hard time finding on the go slim packs. Need to be easier to find. Don't sell in a lot of stores. Rated 5 out of 5 by Deni from Great features I use a Kleenex on the go for a long time. It is a very useful product and always I keep in my purse, in my car, in my pocket. I love the Kleenex on the go and I will use it always. Rated 5 out of 5 by Susan S from I love this new package I have been using the slim pack Kleenex for about a year now and they are just perfect for the small purse I carry. It is also easier to get a tissue out of the package neatly, whereas the thicker "purse packs" are messier. Rated 5 out of 5 by Wagonmom1 from Love these, but where are the cute holiday designs Love how easy these are to dispense. Love the designs available, wish the holiday ones would come back this season and maybe a pair up with Orla Kiely's patterned designs! Rated 5 out of 5 by Bells from Better than the "vertical" Kleenex travel pack I love the Kleenex Slim Packs and have been buying them since first noticing them on Target shelves. I like the style much better than the upright travel pack, because it stays neater in my purse. Plus I think there are more tissues in this one. So handy!! Rated 5 out of 5 by Coral from they are so convenient, fit in a small space I bought these in Indiana, and completely happy with them, nice size I would like to find out which stores carry this product, near post code 93505, I cannot find them anywhere, Please reply to this query. Rated 5 out of 5 by Bella from Idea! I love this packaging because of its size and construction--folded, tape to secure, and slim. I have artistic packaging ideas and am interested in creating a collection. How may I go about doing so? Rated 1 out of 5 by trtn from Horrible packaging!!! What grown man or even boy for that matter wants to carry around kleenexes that say happy tears are the best tears, or hard times call for a soft touch? Or Frozen cartoon characters, really??? We need plain packaging options. There are still men in this world. Rated 3 out of 5 by kittypr02 from BAd scent I trully like the design of the on the go tissue. They are very original. Also like the how soft they feel.Have used many brands and these are the best.The only thing that i suggest you change is the scent. Cause they smell bad .SOme hint's use floral,candy, fruit etc. And yes i received this product for free an a honest review. Rated 5 out of 5 by Gretchen Ann from Kleenex Slimpacks Love the Kleenex Slimpacks that look like a wallet. During the winter I give these away to doctors, visitors and other people I meet. On the pack I put a label which says, "If you need to sneeze, use me please!" They are a hit every wi tee season. Love the new colors and designs. Rated 4 out of 5 by Tenequa from RE: The Packaging I am online,,,looking at the "On the Go Slim Packs". Great idea,,,however I can't tell, from the if there is a Fold Over Cover for this packaging. 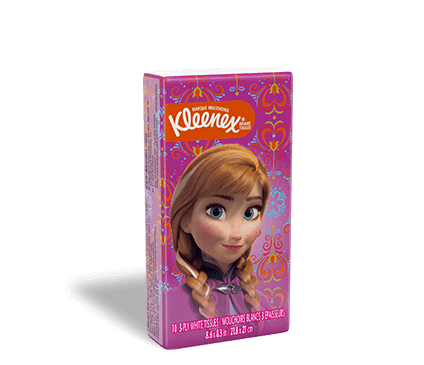 Will these be available in the Stores,,say in a 5-10 pack....always good to have a Kleenex handy!! Would you please send me a Sample Pack.. Rated 5 out of 5 by Diana H from Love the Packaging I love the new "book style" packaging and the little bit of tape that keeps it closed. No more tearing of the little triangle closure. I have allergies and can get to these quickly when having a sneezing attack!! Rated 5 out of 5 by pulilover from Fantastic product I love these slim packs. They fit easily in my jeans front pocket. Is is also very easy to remove a kleenex from the packaging. I do hope that Kleenex continues to make this product. Rated 5 out of 5 by Crystal from Love you this packaging Thank you for these awesome tissues! I love the colors and prints and they fit much better in bags and pocketbooks. I just have one request-- pleaseeeee bring back the Christmas designs!!! They make great gifts, stocking stuffers and are just fun for the holidays. I stocked up on them in 2013 and haven't been able to find them since. I just finished my last pack. I'm really hoping to see them back on the shelves in 2016. Rated 1 out of 5 by WintersBlue from What happened to my Kleenex???? I loved my On-the-Go packs until my last purchase. They were soft and absorbent before. WHY DID THEY CHANGE??? This is like wiping my nose with a thin, scratchy fast food napkin. The edge has a crimped pattern all the way around, they seem smaller, and have only 1-ply. BRING BACK THE 3-PLY SOFT TISSUES in the go-packs! !